Shankly at Christmas is the exciting prospect at Port Sunlight’s Gladstone Theatre this year when four Liverpool legends will be live on stage revealing their own memories and anecdotes about the iconic Anfield manager. Ian St John, Ian Callaghan, Ron Yeats and Chris Lawler join broadcaster John Keith and actor Steve Hazlehurst in a special Yuletide edition of The Bill Shankly Story for one night only at the Gladstone on Friday, December 28 2012. After the show members of the audience can meet the whole cast for autographs and photographs as a lasting souvenir of an evening of football nostalgia and celebration. As the 100th anniversary of Shankly’s birth approaches next year , the acclaimed production comes to the Gladstone for the first time. Tickets, £16 with £13 concessions, are now on sale and would make a perfect Christmas present for family or friends. They are available in person from the Gladstone Theatre box office – adjacent to Port Sunlight Merseyrail station – Monday to Friday 9:00 am to 4:00 pm or by calling 0151 643 8757. Also online at: www.gladstonetheatre.org.uk. For further inquiries please contact John Keith on 07773 715666. 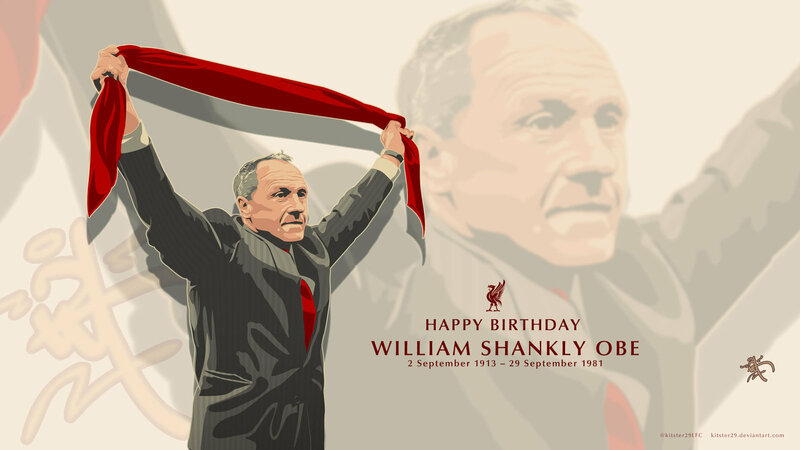 Bill Shankly would have turned 99-years-old on 2 September 2012. See the fantastic tribute wallpaper to the great man made by the artist Kitster29! Liverpool's greatest, Bill Shankly, died on Tuesday 29th September 1981 after suffering a heart attack. The front page of Echo read: SHANKLY IS DEAD. It recorded the official hospital statement: "Mr Shankly suffered a cardiac arrest at 12.30 am and was certified dead at 1.20." Shanks had been battling for life since he suffered a heart attack early on Saturday morning. He had been making good progress until his condition deteriorated yesterday morning and he was transferred to the Intensive Care Unit. His wife Nessie was by his side when he died." On 22nd November 1981 "A Service of Thanksgiving for the life of Bill Shankly" was held at Liverpool Cathedral. Here you can download and listen to Bill Shankly‘s memorial service (play with Real Player) that was broadcast on BBC Radio Merseyside from Liverpool's Cathedral. Several honours have come Shankly's way as in December 50 years had passed since the Scottish legend signed his contract to become manager of Liverpool Football Club. On the 16th Anfield was the stage for an emotional parade of legends along with nine members of Shankly’s family. The sounds of ‘Amazing Grace’ – Shankly’s favourite hymn reverberated at half-time during the game vs Wigan Athletic. A "SHANKS THE LEGEND" mosaic was unveiled on the Kop prior to kick off. The following day Shankly was awarded an Honorary Citizenship of Liverpool in recognition of the 50th anniversary of his arrival as manager of Liverpool FC and his dedication to the region. The award was presented by Lord Mayor Mike Storey on stage during the Shankly Show at the BT Convention Centre in Liverpool. Paul Tomkins' book, Dynasty, is a reassessment and an in-depth analysis of every manager of the club over the last 50 years. Shankly.com offers you an exclusive look into an abridged version of Dynasty's chapter on Bill Shankly. Read Paul Tomkins on Bill Shankly. Have you taken photos of Bill Shankly? Please contact webmaster@shankly.com as we would like to feature them on Shankly.com for all Liverpool fans to share and enjoy! Shankly.com was relaunched by LFChistory.net on 17th February 2009. The original website was created in 1997, but had not been updated for quite a while. LFChistory.net bought shankly.com in February 2008 to revitalize the website to become the definitive internet resource of football's GREATEST. LFChistory.net felt it was important to launch the new shankly.com with the blessing of the Shankly family, which we are pleased to say we have received. Enjoy! "After all the training was complete on Fridays, we always had a talk about the impending game. All the players and subs attended. One of the staff would have watched the opposition and would bring their report in. All I wanted to know was the formation. Was it 4-4-2, 4-3-3 or whatever. And did any of the opposing players have any little characteristics we might want to stifle? I never ever discussed the opposition at length. The last thing you want to do is build up your opponents and frighten your own players. I always tried to have a joke up my sleeve to boost our lads and knock down the opposition. We took our football seriously, but we always tried to get a laugh out of the team talks. And I would always keep a few bombs for Saturday. I might say to the old guy on the Anfield door: 'Here's a box of toilet rolls. Hand them to the opposition when they come through the door.'"